The World Health Organization estimates that one million people die of suicide each year, and the rate will rise to one death in every 20 seconds by 2020. It’s a growing problem worldwide, but you can now help. 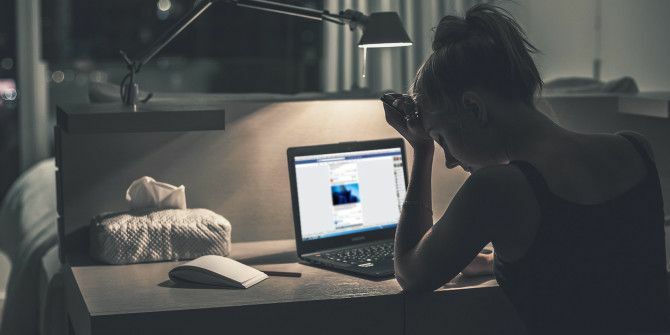 Facebook is known to cause depression Facebook Makes You Sad, and "It Won't Happen to Me" is a Lie Facebook Makes You Sad, and "It Won't Happen to Me" is a Lie Facebook's potential as a trigger for depressive symptoms has been talked about in the past too, but this year has seen more of such studies than before. Here's what they say. Read More , especially when an at-risk individual sees the good-natured highlights of other people’s lives. In fact, social networks seem to be an outlet for various people to voice their dark thoughts before taking any action. To counter this, Facebook and other social networks have developed tools that give you the power to help at-risk friends before the worst happens. Here’s what you can do. The world’s largest social network has been testing a suicide prevention tool for about a year in the US, but only recently made it available globally. “(It is) developed in collaboration with mental health organizations and with input from people who have personal experience with self-injury and suicide,” Facebook says. When you see a post on Facebook that worries you, you can now report it to the authorities or offer to share helpful resources and contact information with the person. It’s all part of the Facebook Safety Center’s features. On desktop: Go to Facebook’s Suicide Prevention page for detailed instructions on different options. On mobile: Go to Menu > Help Center > Safety > I’m worried about someone after seeing content they’ve shared about suicide or self-injury. What can I do? If you think it’s urgent, report suicidal or self-injurious content immediately to Facebook. This form (which works on both mobile and desktop) asks for the pertinent details, allowing you to link to the post, share a screenshot, or copy-paste the text. Facebook says its global team of monitors prioritizes such serious reports. In case of emergency, Facebook recommends alerting a local helpline. Accordingly, it has provided a list of suicide prevention organizations worldwide. Please note that Facebook has additional material in case the concerned individual is an LGBT person, a member of the US military services, or a law enforcement officer. A while back, Twitter launched its Safety Center Twitter Safety Center: How to Protect Yourself and Your Family While Tweeting Twitter Safety Center: How to Protect Yourself and Your Family While Tweeting Twitter has launched a new initiative to address the matters of safety concerns, privacy concerns, kids' security concerns, and so on. Read More , a one-stop portal for everything you need to protect yourself and your family on the micro-blogging social network. One of the tools it hosts is a form to report potential self-harm. Go to Twitter’s suicide prevention form. Enter the relevant Twitter handle and a description of the problem. Twitter advises not to share your own personal information here. Link the tweet concerned and add your own information. Again, if it’s an emergency, you should call a local helpline that will guide you on the best way forward. Twitter has its own list of trusted partners, but we’d recommend using Facebook’s list for that, which is a more comprehensive guide to resources worldwide. In case you don’t know the person yourself or their whereabouts, the Internet has temporary suicide support groups Depression & The Internet: Welcome To Your Temporary Support Group Depression & The Internet: Welcome To Your Temporary Support Group Talking is important, and sometimes the Internet is a good substitute when your real life friends aren't around. Here are three sites I recommend for less formal depression-focused conversations. Read More that can help. Instagram is more than just a place to share photos. Like any social network, it’s where people express their feelings and thoughts. And like any network, sometimes those can be dark. Instagram has been known to act swiftly in taking down inappropriate content, so you should see action soon. They will also reach out to the person and offer resources. If you want to take matters into your own hands, Instagram has a help page for suicide or self-injury. It recommends US users should call the National Suicide Prevention Lifeline at 1-800-273-8255 or start a chat. For those outside the US, there’s a full list of prevention resources. When you see a post on social media that indicates someone is intending to harm themselves, you should report it, but you might want to take action yourself too. Plus, considering how social media feeds depression 5 Ways Technology Might Be Feeding Your Depression 5 Ways Technology Might Be Feeding Your Depression Technology can worsen depression. With tech enveloping our lives, we should be more aware of technology's potential impact on us. There are some things you can do to lessen the burden. Read More , there are other networks too. In such cases, provide the support you can. Please take the first step in getting help by calling the National Suicide Prevention Lifeline at 1-800-273-TALK (8255). We’re here for you 24/7/365. While this message is only useful for those in the US, you can easily help that person by using the same template and replacing phone number and service with information from Befrienders Worldwide, a volunteer group that prevents suicide. Go to the site, select the country of the at-risk individual, and you’ll get a helpline number immediately. Also Read: The Entertainment Industries Council, in association with mental health organizations, has prepared a short dossier of social media guidelines for suicide prevention that has all the dos and don’ts of dealing with at-risk individuals online. We’d like to make this article into a central resource center for anyone who needs information in the case of a self-harm emergency while dealing with someone online. We’ve already shared some helpful resources for depressed or suicidal individuals 7 Online Resources To Help Those Who Are Depressed & Suicidal 7 Online Resources To Help Those Who Are Depressed & Suicidal Even though I am the Managing Editor of MakeUseOf, I have a huge disability in my life which is clinical depression. It started back in 2002, as a depression related to stress in my job,... Read More . If you have any other suicide prevention information that can help, please share it in the comments below.